You've made the right click with Kohrmann Electric! We have provided electrical solutions to southern Illinois and beyond for more than 60 years. 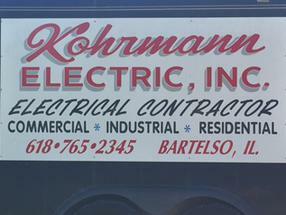 Kohrmann Electric, Inc. is a fully licensed and insured electrical contractor. Since our start in 1955, we have been providing high quality services to clients in southern Illinois and beyond. Our union electricians are up-to-date on safety and technology so that each project they complete is done with compliance. We are a family based business, and we are proud of our hard working electricians and the great reviews they bring our company. "Getting you wired since 1955"